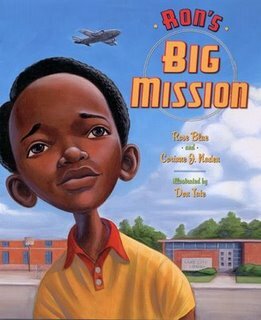 I recently received advanced copies of Ron’s Big Mission (Dutton, 2009), my most recently illustrated book! It is written by Corrine Naden and the late Rose Blue. I was just as excited last week opening the mail, as I was 20 years ago when first received advanced copies of a book I’d illustrated. My first books were for the educational market — books as part of reading programs, teacher’s guides, workbooks (though I still do those). Then there was Retold African Myths, written by Eleanora E. Tate, and another book about a Kinte Cloth teddy bear written by my wife. Finally, after many rejections and almost giving up, I received my first trade picture book contract — Say Hey! A song of Willie Mays, written by Peter Mandel and edited by the great Andrea Pinkney. My longtime dreams had come true. The book received mixed reviews — some panned it, others praised it. Regardless, I’d done my best. And now seven books later — six publishers, ten authors, seven editors and many, many, many better reviews — I’m still in the business and still loving every minute of it. Now, please excuse my shameless plug, I’ve got more books to illustrate. Wow, Don! What a beautiful cover. So rich and full of possibilities.